We’d love your help. 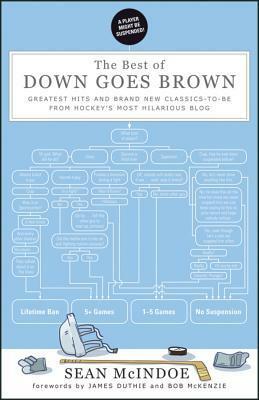 Let us know what’s wrong with this preview of The Best of Down Goes Brown by James Duthie. To ask other readers questions about The Best of Down Goes Brown, please sign up. Had to pick the time of the day/night to read this, as my uncontrollable laughter would wake The Husband up from a sound sleep. Sean McIndoe is incredibly hilarious! Any NHL fan would find much to laugh at in this book. Good collection of humorous hockey writing - unfortunately, it really doesn't stand the test of time (six years) that well. New material + old favorites = Stanley Cup! Love DGB, love his blog, love this book. New articles are as hilarious as the previously published ones. Definitely a recommended read to any NHL fans - great humor from best in the business. I enjoyed it, but am only a casual hockey fan, so many of the references to actual players went way over my head. I got the broad jokes, though. Honestly, in terms of content, this book probably should've been a 3-star. Most of the articles are copied directly from the website with no further editing aside from a few fixed typos (though the new ones added for this book are quite good). The articles in the book have the same strengths (attention to detail, incredible memory for hilarious moments in hockey) and weaknesses (a bit too reliant on bait-and-switch jokes). But in a sport where the current standard for reporting seems to encourage Honestly, in terms of content, this book probably should've been a 3-star. Most of the articles are copied directly from the website with no further editing aside from a few fixed typos (though the new ones added for this book are quite good). The articles in the book have the same strengths (attention to detail, incredible memory for hilarious moments in hockey) and weaknesses (a bit too reliant on bait-and-switch jokes). But in a sport where the current standard for reporting seems to encourage being as boring as possible, McIndoe's articles are a respite from all the bland reporting you'll find on other hockey media sites. Plus, the guy knows his hockey, and often has some pretty insightful observations about the status of the league and the hockey media as a whole. If I told you there was a book combining hockey and comedy, you'd think of Gary Betteman's autobiography. However, instead of a tome about the NHL commissioner, we get this delightful romp from the creator of the "Down Goes Brown" blog, Sean McIndoe. Each chapter is a slap shot to the funny bone as every page is a laugh riot for everyone who enjoys the fastest game on ice. If you're a novice to the game or an aging veteran, this book entertains the reader from cover-to-cover. I highly recommend i If I told you there was a book combining hockey and comedy, you'd think of Gary Betteman's autobiography. However, instead of a tome about the NHL commissioner, we get this delightful romp from the creator of the "Down Goes Brown" blog, Sean McIndoe. Recommends it for: any hockey fan with a sense of humour! Oh, this was such a good read. I have been a DGB fan for some time now. I remember reading some of these on the website. It was so nice to have them all in one place. As I typically read late at night once my wife has gone to bed, I had to be careful while reading parts of this book as I would start to laugh out loud. If you are a hockey fan, with a good sense of humour, this is something you might want to pick up and read. As a die-hard Ottawa Senators fan, leafs fans in Ottawa are pretty much my least favourite people. As someone who also likes the Canucks, the jokes in this book should not amuse me. And yet, DGB's sense of humor, often at the expense of certain teams, players or fanbases, never failed to make me laugh, and only crossed the line a few times. This totally-true mocking of the NHL is a must read for any hockey fan. Definitely more of a 4.5. This book is funny and highly entertaining while also being somewhat informative. I think my only reasoning for the 4.5 instead of 5 would be that it was pretty repetitive. Still think that this is way more for current hockey fans than new fans as it is very sarcastic and full of *wink wink* mentions that don't get explained. For my money there is nobody funnier when it comes to online hockey bloggers than Sean McIndoe (aka Down Goes Brown). His Twitter feed is constantly smart and funnelled through his unique humour. Anyways, the book is exactly that and captures his humour expertly in a bunch of different types of lists and entries, made to be picked up and re-read when you have a minute or two. When I first got this book I leafed through it and laughed at loud at several stories. When I sat down to actually read it later it wasn't as funny or as entertaining as I first thought. It is still good for some giggles and snorts. The book is timely though, in a few years after the players have changed it won't be as entertaining. For the really knowledgable fan, "the Best of Down Goes Brown" is a treat. McIndoe is sharp and on the money without resorting to the a lot of the smartass comments one endures when watching many sportscasts. I liked it and will start to follow his blog on an ongoing basis. If you like hockey, and have a sense of humor, you HAVE to read this book. So good you'll be laughing at jokes about your own team, even if you don't wanna be. Literally a laugh out loud book. Can't wait to read more Down Goes Brown. If you love hockey and love to laugh, and you don't have this book then something is wrong with you. This is a must have for any hockey fan. DGB has such witty and smart humor, loved reading every page. Reminded me of Jim Gaffigan's book. Read the first half in a couple of days and limped through the rest. The jokes get a bit repetitive and formulaic. Overall pretty solid though. Hockey humor at its best, and it's something I can read over and over again. It was great. I love hockey and humour, and this book perfectly combined the two. Completely hilarious. Except for the parts about the Vancouver Canucks, which for some reason, I did not find funny at all. Sean McIndoe is one of the very best hockey writers around, and definitely the funniest. This is an essential read for hockey fans, packed with great jokes and insightful analysis. If you are a hockey fan, then you must own this book! A must read for any hockey fan! Made me laugh out loud in parts, except for the parts where he dissed Sidney Crosby and Matt Cooke. However, the rest of it was pretty funny! McIndoe never ceases to amaze me with his humour. Fun and entertaining throughout, even the ones you've read on his site already.